You won't see anything like this ANYWHERE. Please don't fall for cheap imitations. I am the original. From a distance this looks like a picture of The Hound Dog but look closer. Its actually mini-pictures that are 1/4 inch by 1/4 inch with remarkable detail (click on "close up" image). 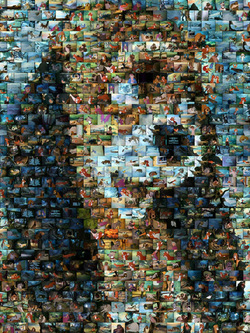 The mini-pictures are roughly 590 actual frames from from the classic movie THE FOX AND THE HOUND. I have gathered and arranged these very carefully myself. I even had to use a few of the credit frames. Remarkably NO frames were used more than once and no color was adjusted to any individual frame. This is for the true collector. The entire item is 8 1/2 inches by 11 inches and perfect for framing.